The new version of GPU-Shark is out. 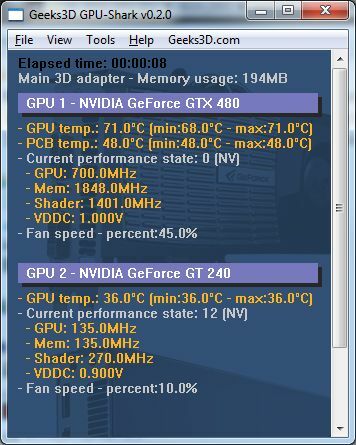 GPU-Shark is a tiny GPU monitoring tool for GeForce and Radeon based graphics cards and is available for Windows only. GPU-Shark offers a global view of all your graphics cards in a single window. GPU-Shark is made up of a single executable file and requires no installation. Just copy it somewhere and run it! 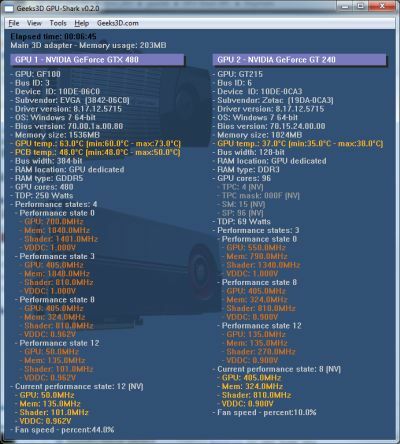 More information about GPU-Shark can be found HERE. New: added memory usage for NVIDIA cards. New: added the TDP (thermal design power) if available. New: added subvendor names: ASUS, Palit and Gigabyte. Change: removed the flickering effect that occured at each update. Change: when graphics drivers are not supported, GPU-Shark tries to display only OpenGL information. Change: Caption in View menu: Detailed mode or Simplified mode. Change: vertical scrollbar a bit shorter. This tool is amazing for its simplicy and great info that display. I think this tool is unique and very useful. I need a program that lets me choose betwin Intel HD card and Nvidia. Like gfxCardStatus for MAC but for Windows.